Understanding Stress : What is Stress? On occasions, all of us experience stress. Beneficial stress can help drive a few of us to become Olympic champions, but harmful stress can drive others to despair. A force as powerful as that should always be handled with respect. Stress in individuals is defined as any interference that disturbs a person’s healthy mental and physical wellbeing. It occurs when the body is required to perform beyond its normal range of capabilities. The results of stress are harmful to individuals, families, society, and organizations, which can suffer from “organizational stress”. 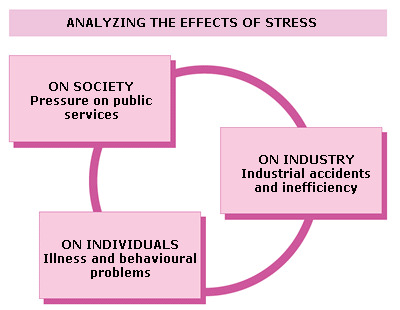 The societal costs of stress are already high – and are increasing steadily. Society bears the cost of public services such as healthcare for those made ill by stress, pensions for early retirement brought on by stress, and disability benefits for accidents occurring because of stress. In addition to this, stress often makes people irritable, and this affects the overall quality of everyone’s lives. Stress costs industry over $150 billion a year in the US alone – through absenteeism and reduced levels of performance by those who are physically present but mentally absent. In the UK, as much as 60 per cent of all absenteeism is believed to be caused by stress-related disorders. Anything that can reduce the damaging effects of stress makes workers happier and companies richer. When the human body is placed under physical or psychological stress, it increases the production of certain hormones, such as adrenaline and cortisol. These hormones produce marked changes in heart rate, blood pressure levels, metabolism, and physical activity. Although this physical reaction will help you to function more effectively when you are under pressure for short periods of time, it can be extremely damaging to the body in the long-term. 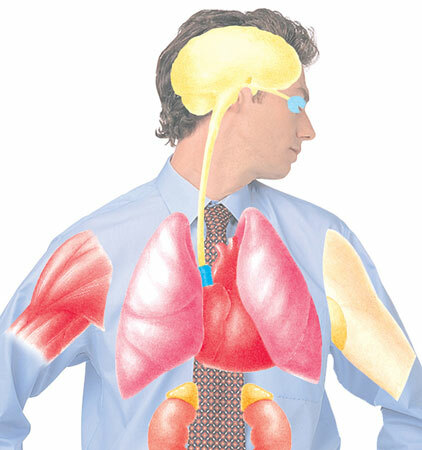 The physical symptoms of stress can affect the whole body, particularly the cardiac and respiratory systems. Long-term stress has been identified as one of the most prevalent causes of numerous common conditions, including high blood pressure and heart disease. It is now commonly thought that prolonged stress can also increase the risk of psychological or psychiatric ailments. Behavioural changes caused by stress, such as the increased and excessive use of alcohol or drugs, are also linked to a marked decline in physical health. When under an abnormal amount of stress, the risk of dependency on alcohol is very high. Apart from major physical health problems caused by excessive drinking, over-consumption of alcohol can also result in highly strained and therefore stressful personal relationships, both in the home and at work. Alcohol abuse, resulting in worker absenteeism, is reckoned to cost the US economy more than $100 billion annually. Prescribed drugs such as tranquillizers, while sometimes useful in the short term to tackle the symptoms of anxiety, can be addictive and have side effects such as loss of concentration, poor co-ordination, and dizziness. Tranquillizers, by their very nature, are not a cure for stress since they do not deal with its fundamental causes. Those who suffer from stress are far more likely to indulge in destructive behaviour, which can have a high cost to themselves, to employers, and to society. Typical symptoms such as mood swings and erratic behaviour may alienate colleagues as well as friends and family. In some cases, this can start a vicious circle of decreasing confidence, leading to more serious emotional problems, such as depression. The incidence of psychological disorders, such as panic attacks and obsessive behaviour, increases with the build-up of long-term stress. Worries can reach such a level that they surface as a frightening, painful physical sensation, which can be mistaken for a heart attack. People under prolonged stress are more prone to irrational fears, mood swings, and phobias, and may experience fits of depression, anger, and irritability. Suffering from any level of stress can rapidly cause individuals to lose their ability to make sound decisions, especially if their self-confidence fails. This affects health, family, and career alike, since stress in one area of life inevitably affects others. Someone suffering from stress may not heed physical signs of illness, attributing them to the side-effects of stress. Faulty decisions made in the workplace and at home may lead to accidents or arguments, financial loss, or even the loss of a job. Stress can break up homes and families. The high divorce rates in the West are due partly to the rapid increase in stress in the workplace, especially where both partners are working full time. It is difficult to be find the energy to be supportive to family and friends if work is very difficult or you are afraid that you may lose your job. When children are involved, stress can cause a conflict relating to childcare and careers. Although we do not yet fully understand the long-term impact of separation or divorce on children, we know that it is not the best way to create a generation of stress-free individuals. This requires a very careful balance of the demands of work and home. Stress is caused by a failure to balance conflicting demands. Juggling work commitments, social life, and childcare may mean that not enough time or energy can be devoted to any one activity. Suffering from stress should not be considered a sign of weakness. Stress is infectious. It is stressful to live and work with people who are suffering from stress. Stress is produced by high demands in life combined with high constraints and little support from colleagues or family. There is no formula guaranteeing a stress-free life, but there are techniques for minimizing stress. Learn how to spot your stress warning signals, and then act on them. Do not be afraid to talk about situations that you find stressful. Take a stroll when you are stressed – it can help restore your perspective. Avoid the habit of taking work home with you every night. Try to be aware of any changes in your eating and drinking patterns. “Talk truth to power” – do not be afraid to tell your line manager what really goes on in the office.